It feels like 2017 is flying by! 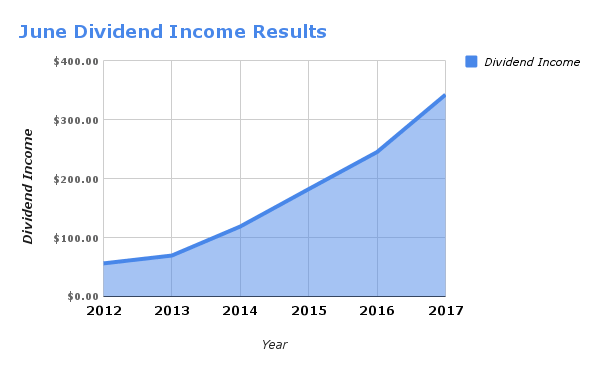 We are now halfway through the year, and the dividend income continues to pour in. And this past month … it really started to pour in as we set a new all time monthly record! And on top of a record dividend income month … we also continued to build our portfolio foundation up by investing new money into the market. It was a big month for new investments, which will fuel our future growth and income. Speaking of growing our portfolio … besides new investments, there are two additional ways we can build our future income that don’t take much work (or money). First, we are able to grow our portfolio (and future income) by reinvested all of the dividends we earned … either through dividend reinvestment plans (DRiP) or through one off transactions in our Robinhood account. Secondly, future growth is also helped through different company dividend increases, which we received 4 this past month. Getting these increases is awesome … because we didn’t have to do anything except hold onto our shares for the long term. For the first time ever … we earned over $300 in dividend income for a month. And it wasn’t by just a little bit either. 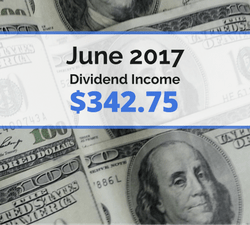 We earned an awesome $342.75 in dividends from stocks that we own during June. This sets a new all time record for monthly dividend income earnings for us! It shatters the record we set back in March (2017) by over $60. We saw an increase of 39.7% last month compared to June 2016! Overall, we had 14 stocks pay out a dividend in June. Solid dividend paying companies like Aflac, Johnson & Johnson, and McDonald’s gave our family a paycheck for not really doing much at all. You can’t really beat that! Recent investments in Aflac (AFL), Archer Daniels Midland (ADM), and Target (TGT) over the past year are a big reason for these increases. As you can tell below, we have been up and down with these new investments. The good news is that the last two months (May & June), we have been meeting our goals. Plus in April, we had a big boost from investing most of our tax refund. 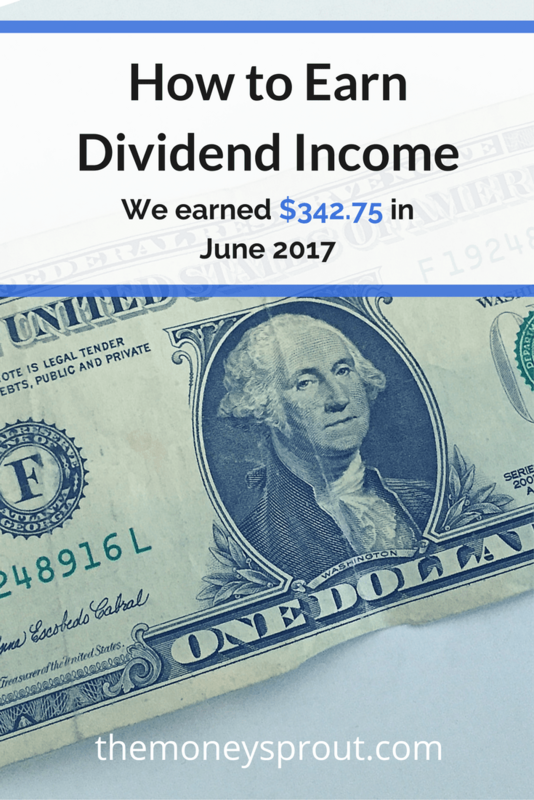 The dividend income earned in June ($342.75) was up over almost 40% from the same time last year. That is truly incredible that we have grown our dividend income by that much over the past 12 months! On top of the growth, for the first time ever we topped $300 in a month for dividend income. This is another little milestone that we hit and will help motivate us to keep building and growing our sustainable income stream. Speaking on company dividend increases – we got several this past month – Lowe’s (LOW) 17.10%, Caterpillar (CAT) 1.30%, Realty Income (O) 0.24%, and Target (TGT) 3.30%. Overall, those increases will boost our annual dividend income by $11.61! That is just awesome. We have earned a total of $1,206.23 in dividends for 2017 … which means we need to earn around $1,200 the remainder of the year. That is an average of $200 per month. Full Disclosure – At the time of this writing, we owned shares in the following stocks noted in this post – ADM, AFL, CINF, CSCO, CVS, ED, EMR, INTC, JNJ, MCD, MSFT, NCS, O, QCOM, TGT, UL, WMT, and XOM. The material above is not a recommendation to buy. Please do your own research on a company before deciding to invest.